What is Aromatherapy and What Does It Have to Do with Feng Shui? Aromatherapy, as the name implies aroma-therapy is the study of the therapeutic power of pure essential oils. The aroma, or the scent of the essential oil extracted from various parts of the plant - be it from flowers, seeds, bark, leaves or roots - has strong therapeutic properties that were explored by healers since ancient times. The energy of specific essential oils can help heal one's body and mind, this is why aromatherapy is considered a form of alternative medicine. The healing is happening by helping the body awaken its own healing powers, so aromatherapy is an indirect and very gentle form of healing. There are many ways that aromatherapy effects are employed. The first one is by diffusing essential oils into the air, thus improving the quality of air and shifting the energy of any given space. The second one is by directly inhaling specific oils in order to achieve the desired results, and the third one is by topical skin applications, as in diluting essential oils in a base, or carrier oil, for an aromatherapy massage, for example. There is a powerful connection between aromatherapy and feng shui as both disciplines work on an energy level to create a positive shift in one's well-being. You can use an aroma mist to easily spray essential oils into the air. An aroma mist is basically a blend of one or several pure essential oils in purified water. Before misting the air you shake the bottle to evenly distribute the oils and then spray them into the air. It is that easy! Aroma mists can be purchased in many health food stores, new age bookstores or from many online retailers. You can also make your own aroma mist by mixing 5-15 drops of your favorite essential oil in 100 ml of purified water. A diffuser, either electrical or a candle one, is an easy way to constantly diffuse the pleasant aroma of essential oils into the air. While a candle diffuser needs a bit more attention and care - you want to be sure the water levels are always sufficient in order to avoid burning the diffuser - an electrical one provides a much easier way to enjoy the healing power of essential oils. You can find candle diffusers in most shops today, and electrical ones in more specialized stores, or, again, through online retailers. You can even buy an aromatherapy diffuser for your car and enjoy the healing power of aromatherapy if you have to drive long hours! Aromatherapy candles are always an easy and very convenient choice, just be sure that the oils used in your candle are pure oils and not synthetic fragrances. You can also experiment with incense made with essential oils, even though this is the least preferred way to experience the healing power of oils because most incense on the market is made with artificial fragrances. The use of aromatherapy is becoming an integral part of good feng shui because the essence of feng shui is healing. Just like specific essential oils bring a certain quality of energy, the same applies to numerous feng shui cures - from the use of color to the use of various feng shui symbols. You do not need to know a lot about aromatherapy in order to enjoy its benefits in creating better feng shui energy in any space. All you need to explore is the feng shui properties of essential oils and then choose a couple of oils to experiment with. As everything is energy, you can create a specific atmosphere by combining different elements that express the same quality. For example, if you want to create an energized, vibrant space in your office, you can choose various expressions of active energy, such as the color red, triangular shapes, active images, moving items, and add the power of such active essential oils as peppermint, lemongrass, bergamot, etc. By the same token, if you are looking to create tranquil energy, the use of colors blue and green, horizontal shapes, relaxing images along with the use of soothing, relaxing scents such as lavender, chamomile and rose will all contribute to the energy of a peaceful, healing space. Start with just a few essential oils and see how they influence your mood, as well as the energy in any given space. Most people are familiar with lavender and various mints, so this is a good way to start. 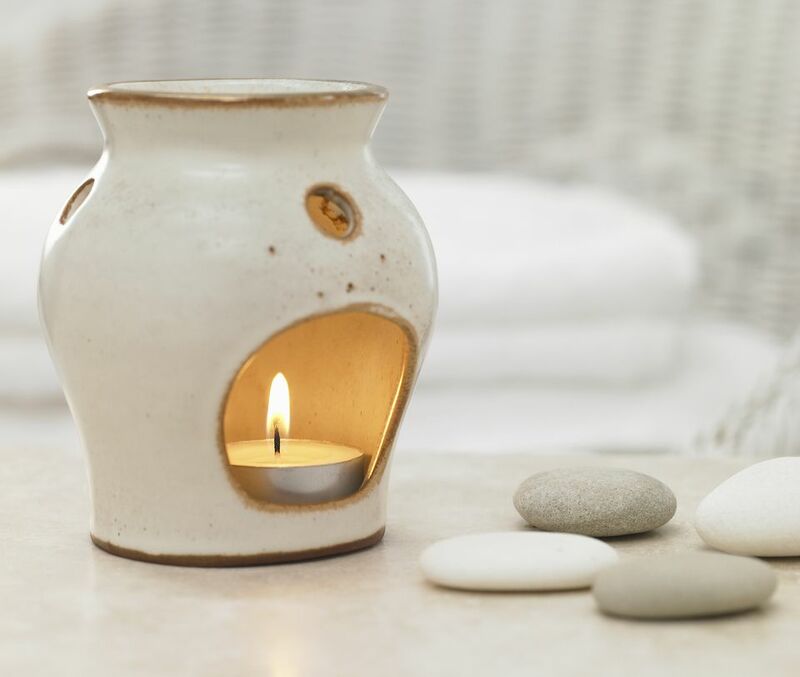 All you need to enjoy the benefits of aromatherapy is a good quality essential oil, a candle diffuser and a candle! Fill your candle diffuser with the proper amount of water, place a few drops of lavender, light the candle and place the diffuser close to your bed. Be sure to check the levels of water from time to time and see what a difference the healing scent makes to the quality of energy in your bedroom! Essential Oils or Fragrances? Here's the Difference.